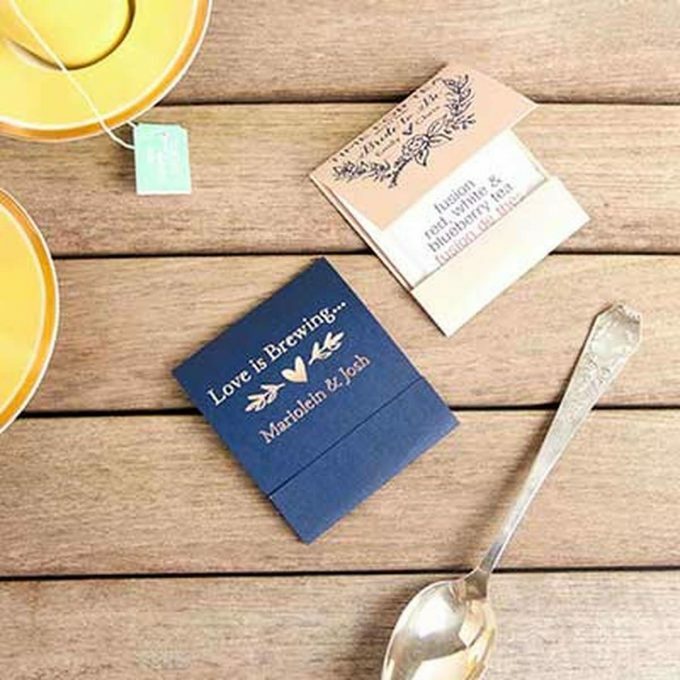 Looking for the best wedding favors ideas? We’ve found them! 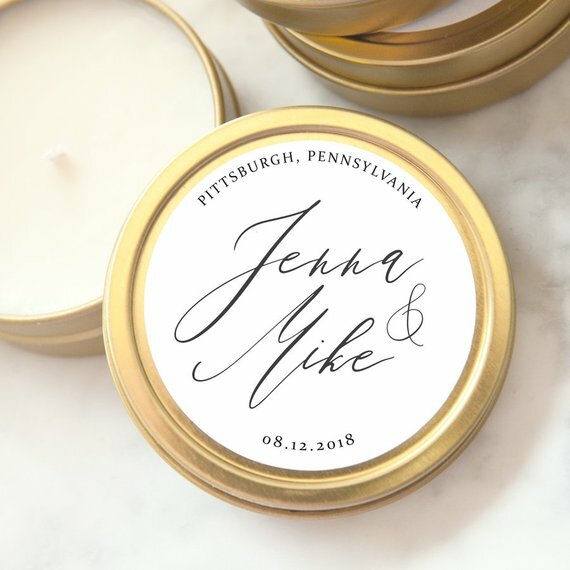 Every couple wants to pick out a great wedding favor for guests; similarly, no one wants to make the mistake of buying favors their guests will never use. So, we’re here to help! 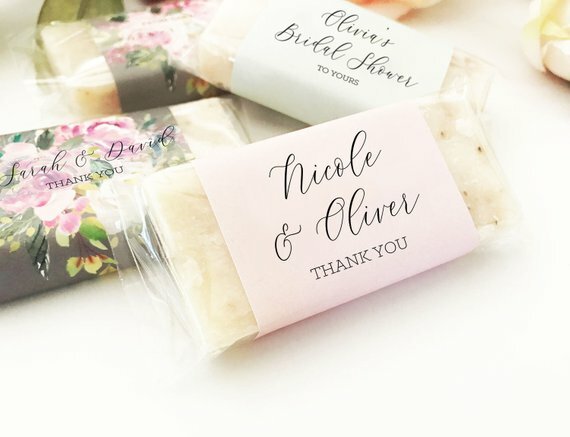 Today we’re sharing the best wedding favors ideas to inspire you as you choose yours, including practical wedding favors your guests will really love. Right now, the most popular favors for guests are functional items — you know, things guests will really use. 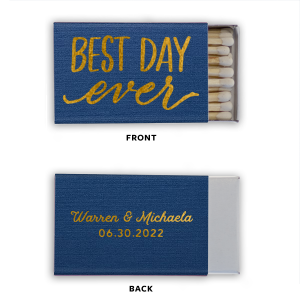 In addition to functionality, couples are also looking for the best wedding favors of the moment that won’t break their budget. If this sounds like you, you’ll love this round-up! 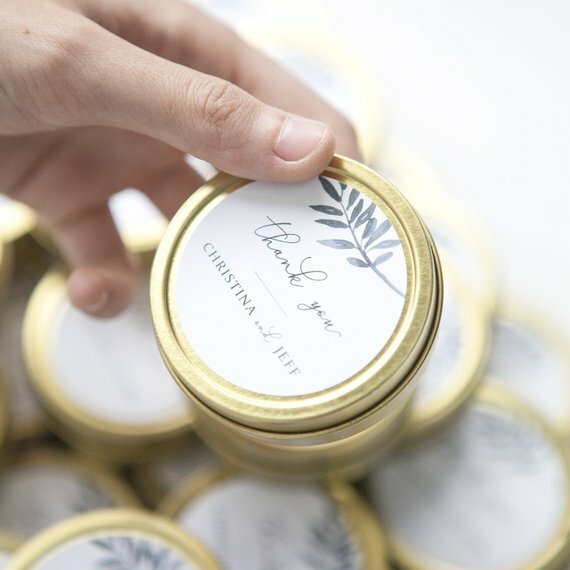 In this list, we’ve curated the best wedding favors ideas, including a good mix of budget and more luxury finds, all available online right now. 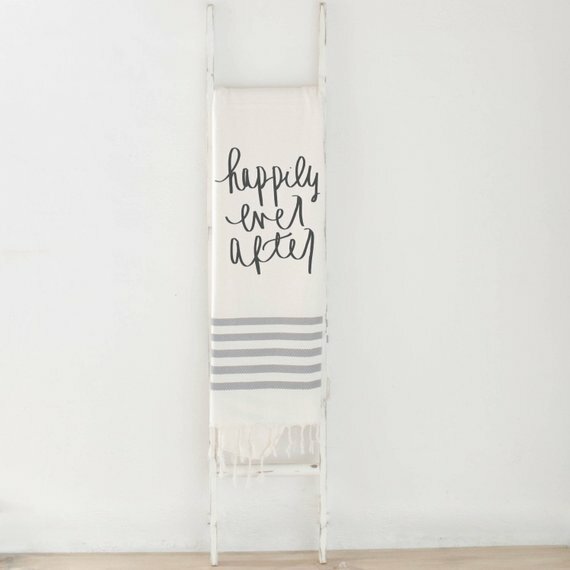 Read on to find out a few tips, along with our HUGE list of the best wedding favors ideas! Enjoy! Before we get to the list, here are a few tips to help you when buying your favors. When you find the favors you want to order, buy them as early as possible. Sometimes, prices shoot up as the season gets busier… and you don’t want to run into the problem of there not being enough stock to accommodate guests. It is a good idea to order a sample, if you need to; however, once you are ready to buy, get them all at once. And buy in bulk! You will save so much money buying a large quantity. And that’s about it! Now… on to the list! 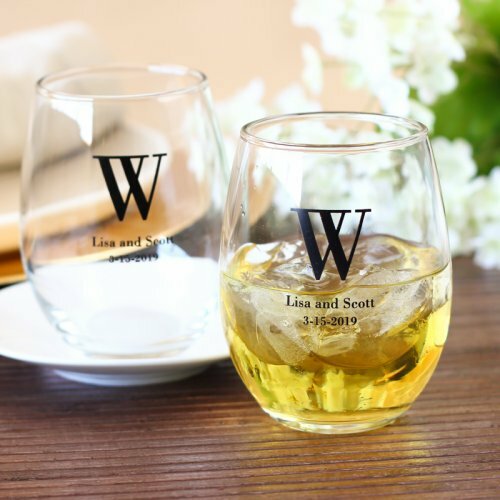 Whether you’re planning a wine themed wedding (one of my favorite themes for fall) or just love these as wedding favors ideas, stemless wine glasses — personalized! — are one of the trending favors right now. At under $2 each (yes, customized!) 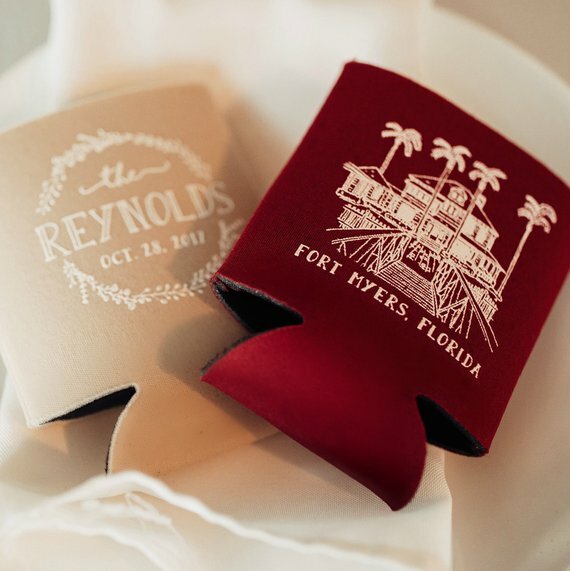 you can impress guests with a beautiful, functional favor and have a keepsake from your wedding without breaking the bank. By Beau-coup. Buy them here. As you can see, the wine glass favors really look different depending on what you put inside. Want a deeper, rich look for fall? 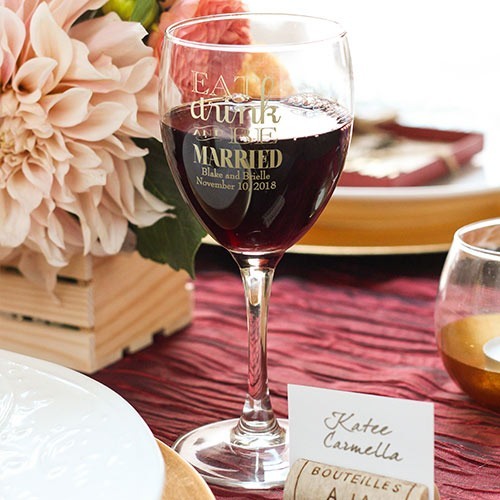 Serve red wine in glasses, set at guest seats, right from the start of your reception. Gold personalization on the front really makes this favor pop. 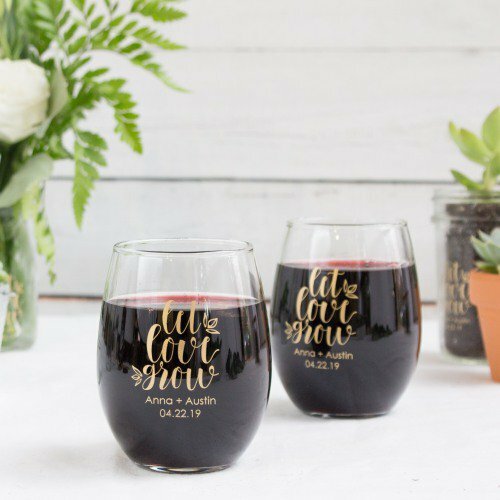 Here are three additional examples of the wine glass wedding favors. This style is my favorite for classic / traditional weddings. If you prefer the look of a stemmed wine glass, those are available, as well. Here’s an example! I adore the “eat, drink, and be married” design on the front. 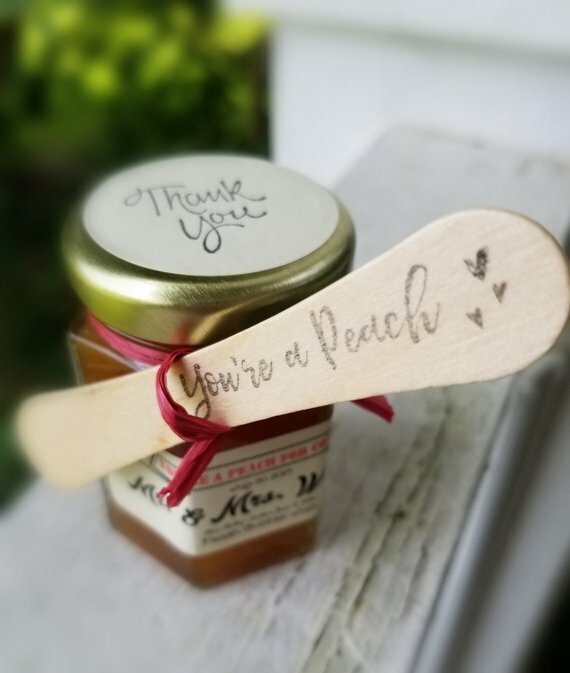 I loved these heart-shaped measuring spoon favors, which were given to guests at my own wedding shower! And to be honest, I still use them to this day (and guests have told me they use them, as well). 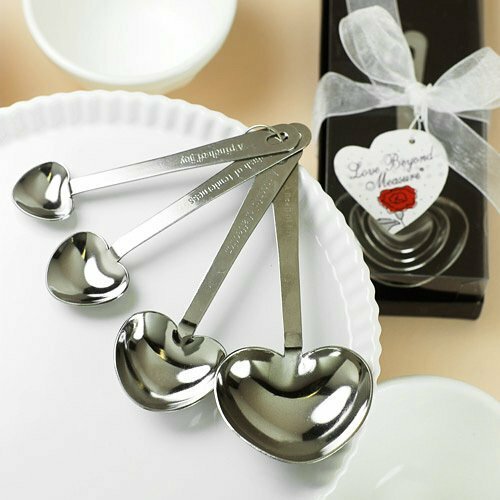 This is one of the most practical wedding favors ever — you’ll never stop using measuring spoons, and these make baking and cooking so much more fun! We’ve seen these sold many places, but the best price we’ve found is here. You can buy here in bulk to save money. 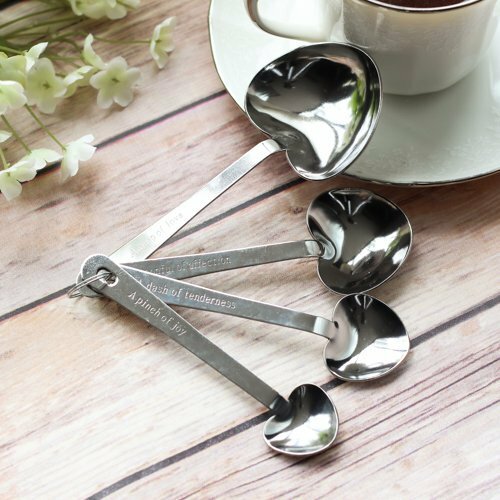 The measuring spoons include four clever and romantic phrases, such as “a heap of love”, “a spoonful of affection”, “a dash of tenderness”, and “a pinch of joy”, engraved on each spoon; traditional measurements are engraved on the back side of the handle (1/4 teaspoon, 1/2 teaspoon, 1 teaspoon, and 1 tablespoon) on the back for reference. Since these wedding favors are made of stainless steel, they will not tarnish over time. I can vouch for this, as mine have been used, hand-washed, used again, put in the dishwasher, etc. with no tarnish — and it’s been a few years. Spoons come gift-boxed all ready-for-giving to guests, or you can remove them from the gift box and tie them with a ribbon, as my mom and sister did (and they looked amazing). 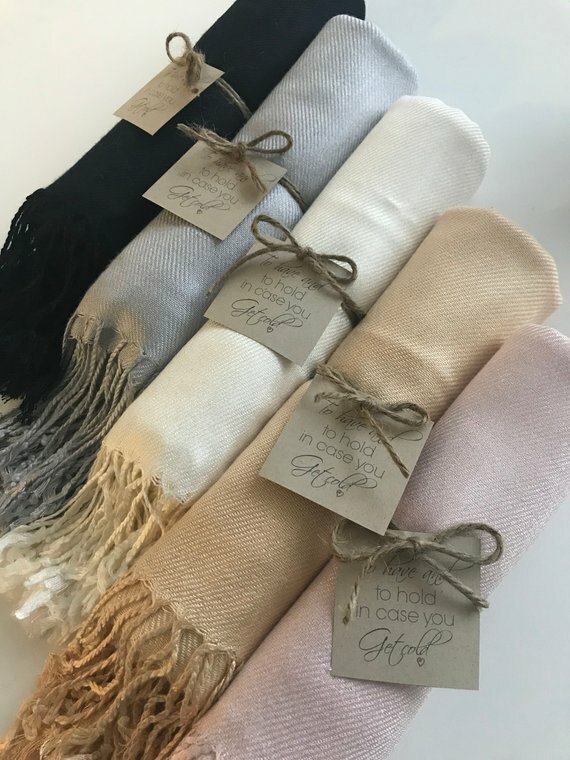 These ultra-soft scarves / pashminas are one of the most popular wedding favors ideas, especially for fall and winter weddings. You can offer these favors to the females and choose something else for the gentlemen. By MiaKraftsShop. You can buy here. Many colors available! 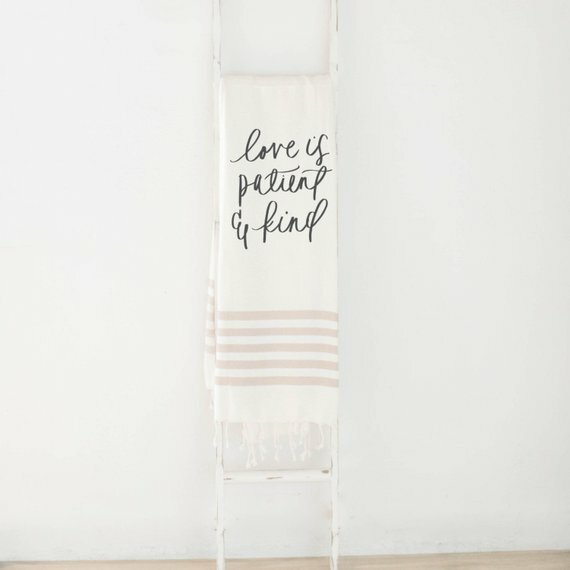 These pashminas also make lovely gifts (and affordable, too!) for your bridesmaids. 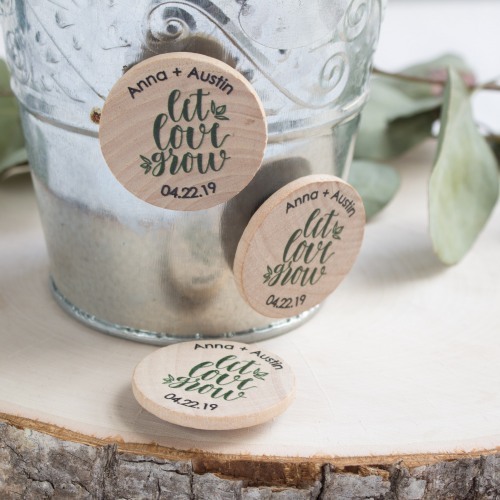 Bottle opener favors are, as you can probably imagine, one of the most popular wedding favors ideas because of its functionality, price, and ability to be personalized. While there are many (MANY!) 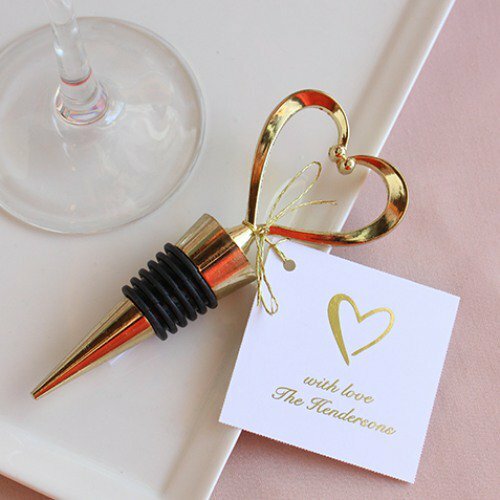 bottle opener favors to choose from, we really love these openers spotted at Orange County Gifts. They look modern and tie in with nearly any decor; plus, you can have them customized any way you’d like. The price is also competitive and these are handmade by an independent artist (how can you not love that?!) Buy here. 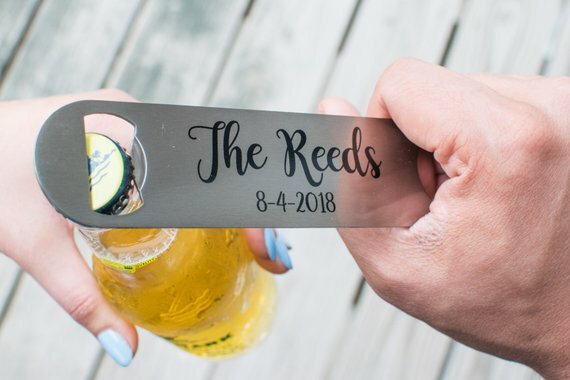 These bottle openers also make great gifts for your bridal party. 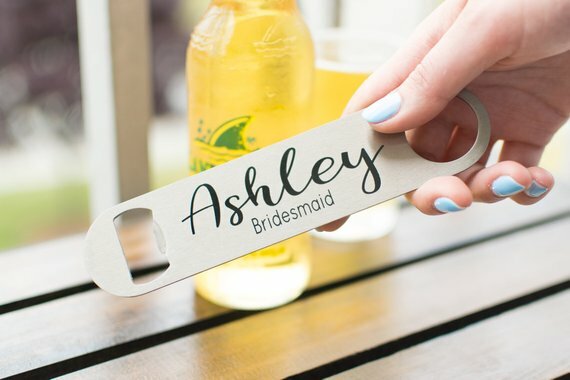 Here’s an example of a personalized bottle opener for bridesmaids. 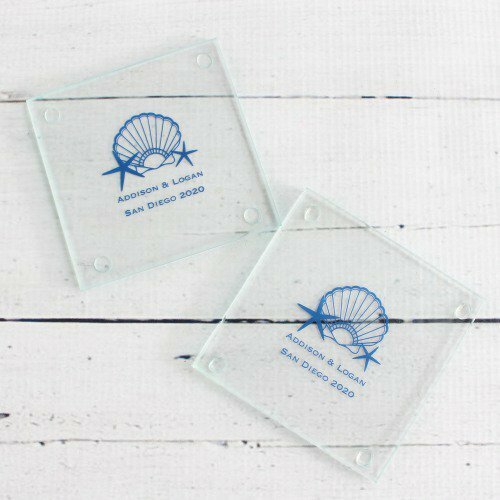 Glass coaster favors, like these spotted at Beau-coup, are a practical favor your guests can use at home. 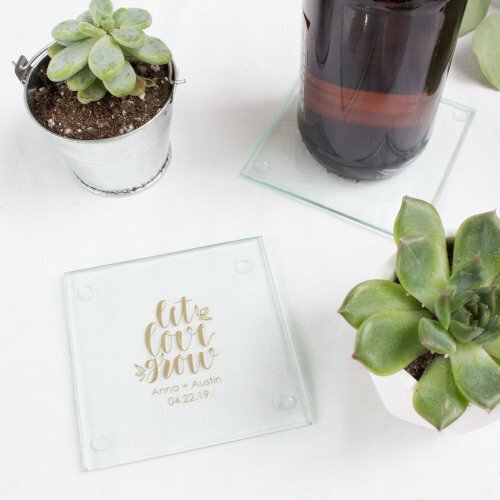 With subtle details and a modern, refined style, these coasters will blend effortlessly with any wedding decor. Buy here. 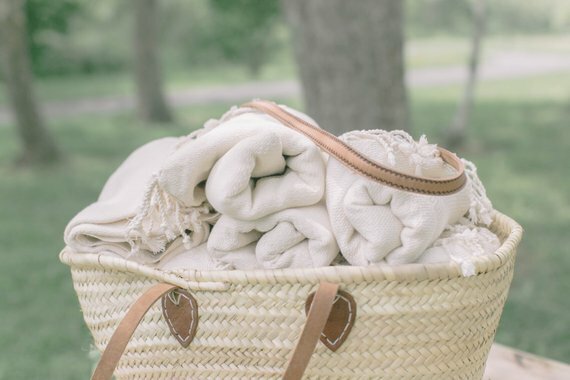 OK — these are a bit pricey, but have you ever seen wedding favors as sweet, cozy, and functional as these throw blankets? 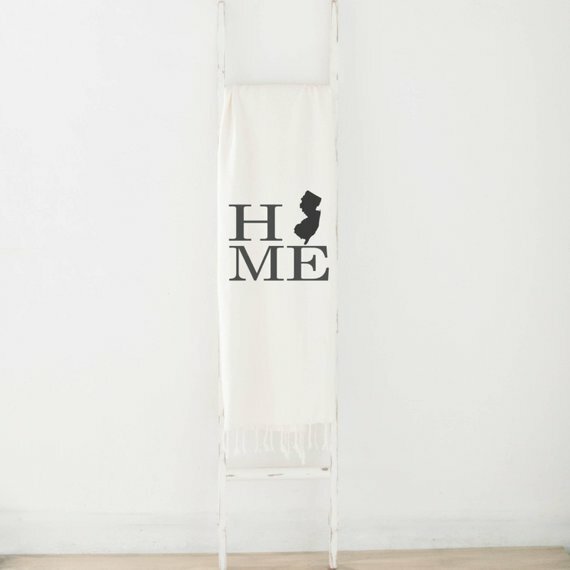 I love the design on the front: “home” with your state in place of the ‘o’; “love is patient and kind”; or “happily ever after”. So stylish! By PCB Home. You can buy in bulk here. Here are up-close examples of the throw blanket styles available. If you’ve read this blog for awhile, it’s no secret that I really (really!) enjoy coffee. 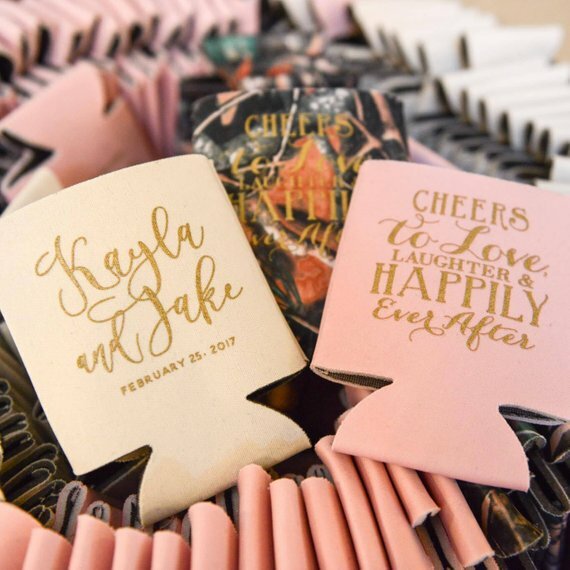 Whether you’re planning a coffee themed wedding, want to plan a coffee wedding bar, or know your guests will love a take-home coffee mug, these are the favors for you! 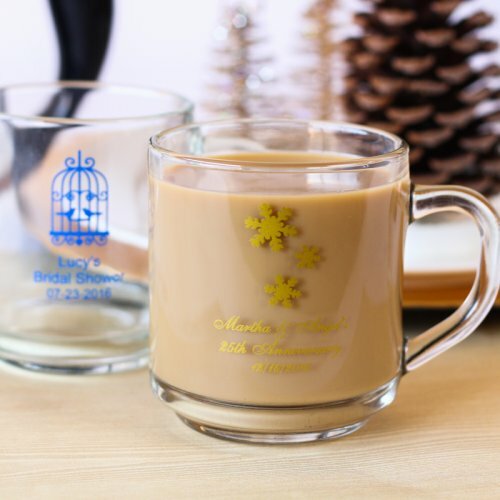 These personalized coffee mugs are made of glass and are amazingly modern and stylish. Choose your favorite fonts, symbols / graphics / icons / etc. to really make these your own. 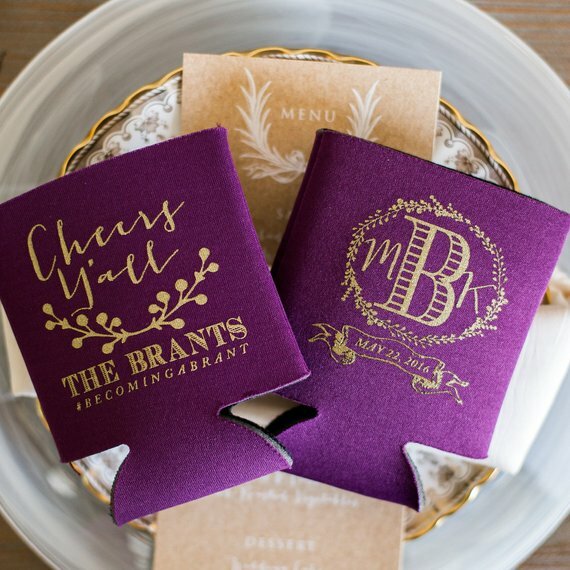 Great for weddings of all seasons, but I can imagine pumpkin spice lattes or hot cocoa favors served in these would be a huge hit for fall / winter weddings. By Beau-coup. Buy here. 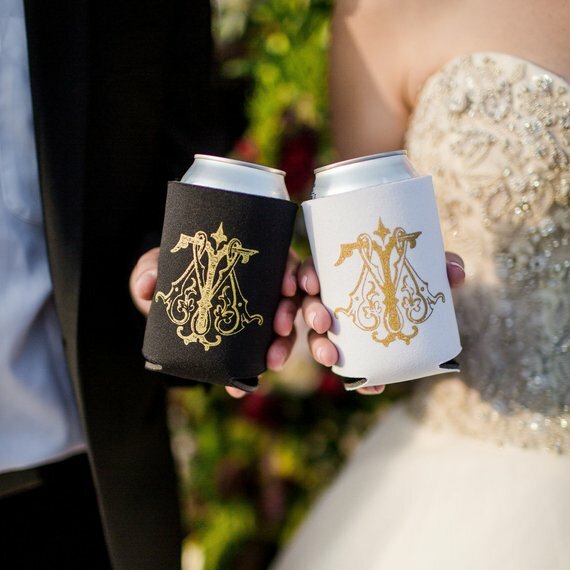 A newer addition to this list of wedding favors ideas is a can cooler, growing in popularity in the past two years. Can coolers used as promotional items used to look so drab and boring; not anymore! 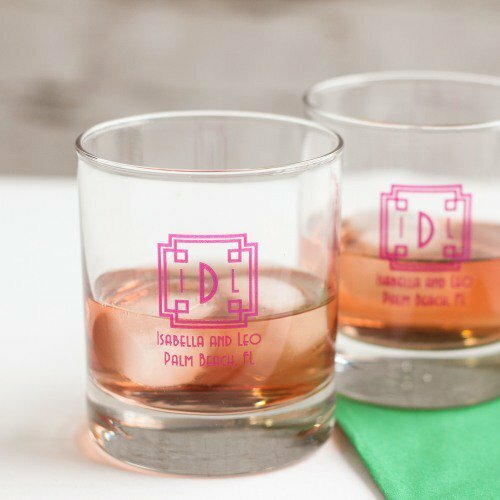 Thanks to beautiful colors and designs, these can cooler favors from Sip Hip Hooray take cooling your drink to the next level. 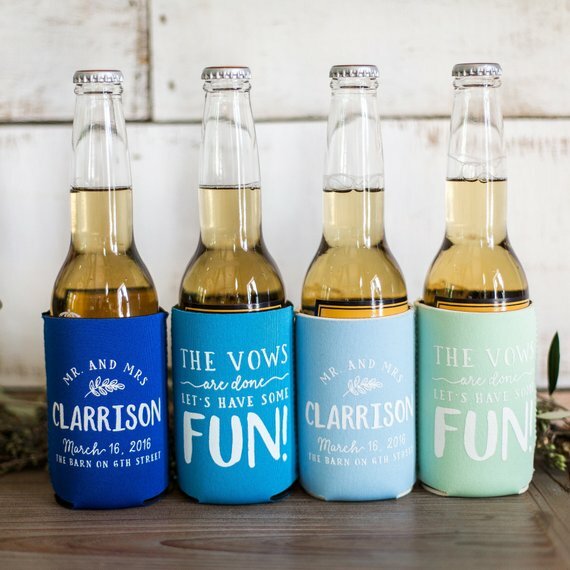 Keep your drinks cool at the wedding and beyond! Choose from a variety of colors to coordinate with your wedding, along with designs to tie in perfectly with your theme. Buy here. Here are a few of our favorite hand-picked can coolers from the shop, just to give you an idea of what styles are offered. 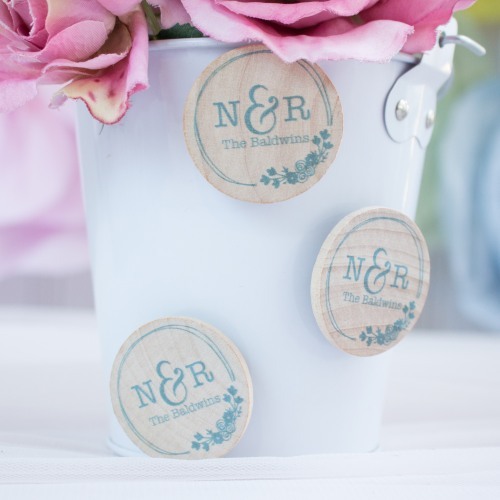 For under $1 each, you really can’t go wrong with these (adorable) wedding magnets! They make an easy favor for guests to use on their refrigerator and personalization is a breeze. I’ve seen couples use these as save the date announcements, too, sent in the mail with their wedding date on it. Great choice either way! You can buy them here. 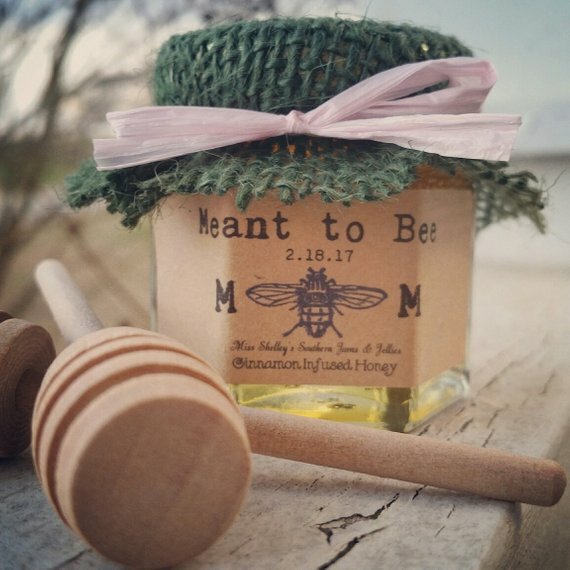 As with most of these wedding favors ideas, you can totally customize them to your liking before you order. Here are two examples of other styles designed by couples in the past. 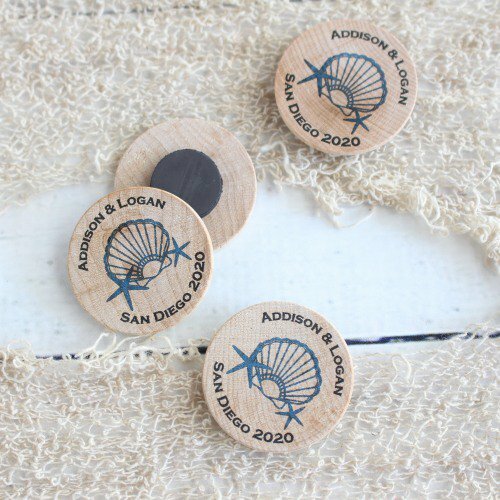 These favors are great for a beach wedding. 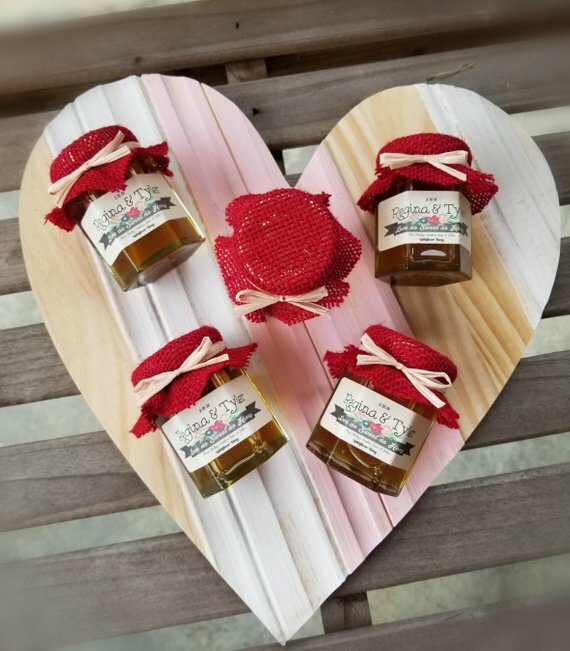 These small bottles are a bit pricey, yet they seem to be a HUGE hit among couples and guests alike! 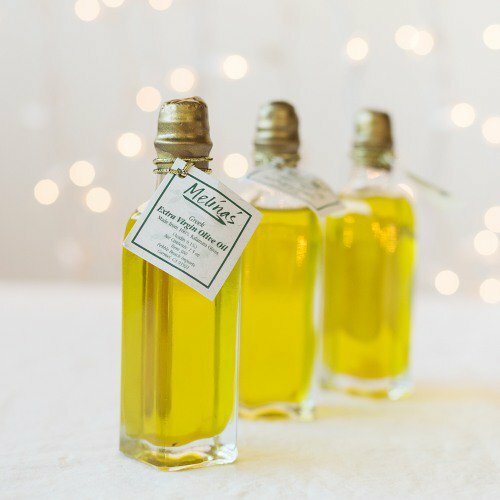 These glass bottles are pre-filled with your choice of delicious oils and vinegars. By Beau-coup. 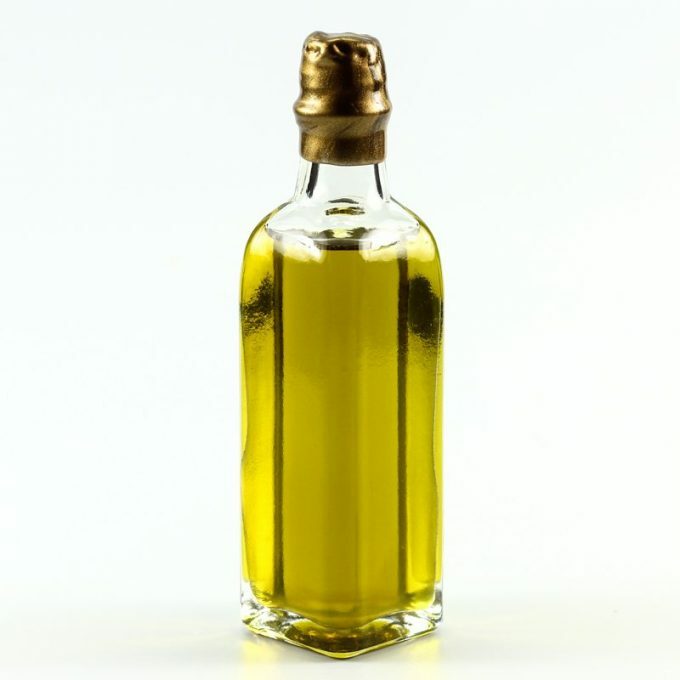 The extra virgin olive oil — the best-seller — is made from Kalamata olives and imported from Greece. The aged balsamic vinegar, another fan-favorite, is imported from Modena, Italy. All bottles hold 2 ounces and are bottled in California. We love the bottle seals, which are gold, green, or burgundy. Buy here. 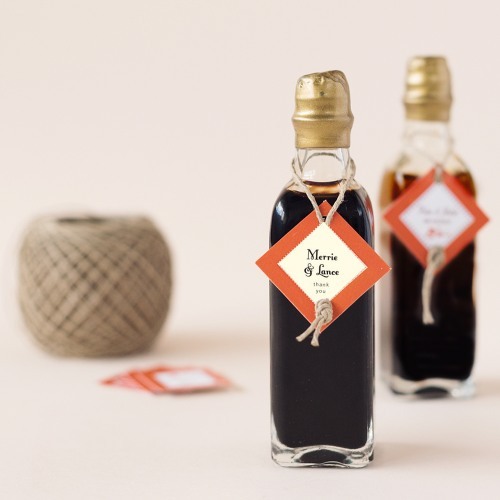 You can choose from the following flavors for your oil and vinegar bottle favors: aged balsamic vinegar, balsoli dipping oil and vinaigrette, extra virgin olive oil, oreganato, pepperino, or pico olio. Read the descriptions of each here. Here’s a closer look at the detail on this bottle. They look really lovely! And you can see the seal up-close here, too. 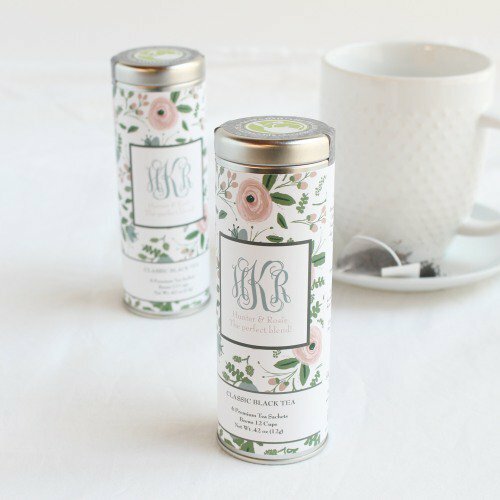 These tea tins are one of the newest wedding favors ideas and we love the look! You can customize the design completely, including colors and paper wrap design. I love the floral design (below) and the “let love brew” designs best. 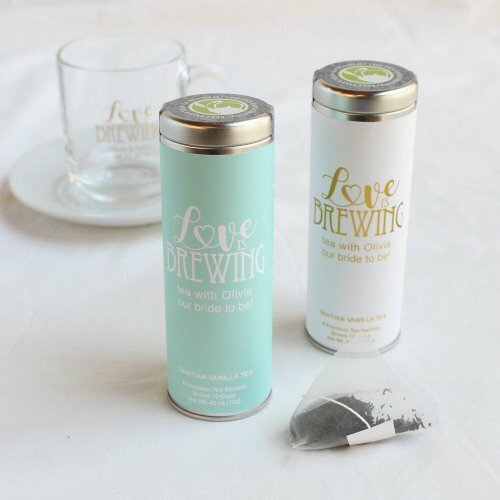 Tea is included inside the tins, and you can choose from six flavors. Buy here. 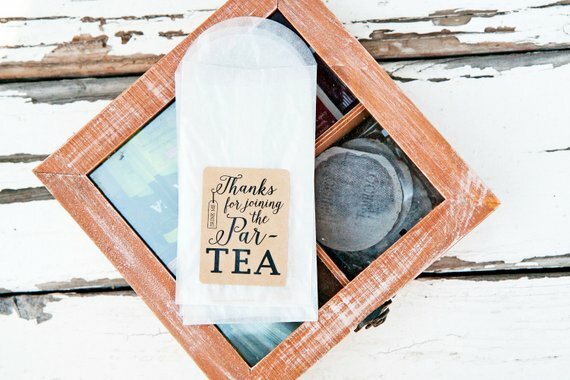 If you prefer a DIY approach, you can make your own tea favors with these darling favor bags made by Mavora Art + Design. 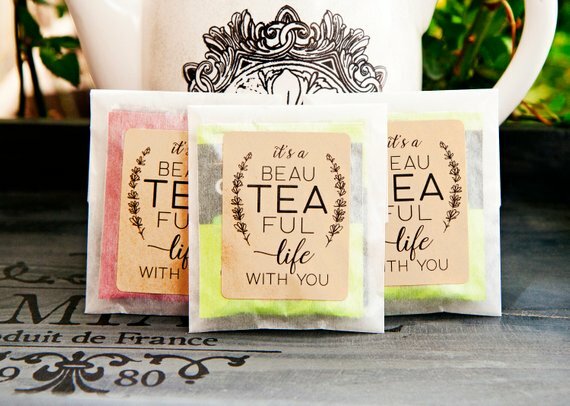 Additionally, you can give these custom tea favors we spotted at For Your Party, which gives you space to include one tea bag inside each. I told you I’m crazy for coffee, and luckily I’m not alone! 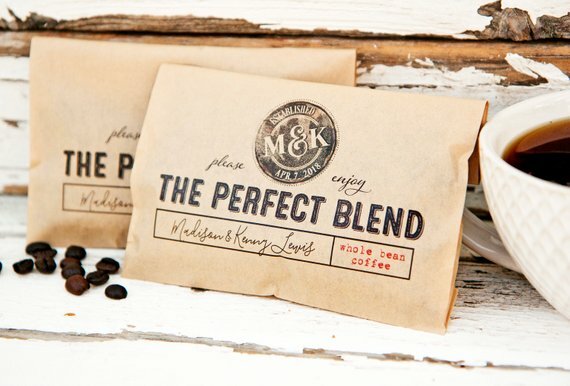 Many couples are gifting guests with these charming coffee favors, one of the most sought-after wedding favors ideas of the year. Handmade by Mavora, these clever bags are easy to fill yourself with your favorite whole bean or ground coffee. We recommend buying the coffee in bulk (this is a great buy for ground coffee, and we recommend this for bulk whole coffee beans). Buy here. There are many designs available for these coffee favors. 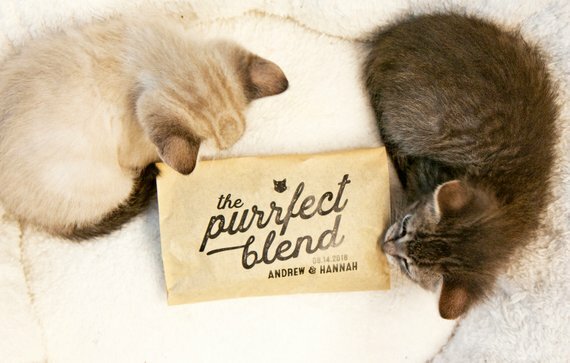 I happen to like coffee and I’m a cat lover, so you can imagine these favors would be hilariously perfect for me! 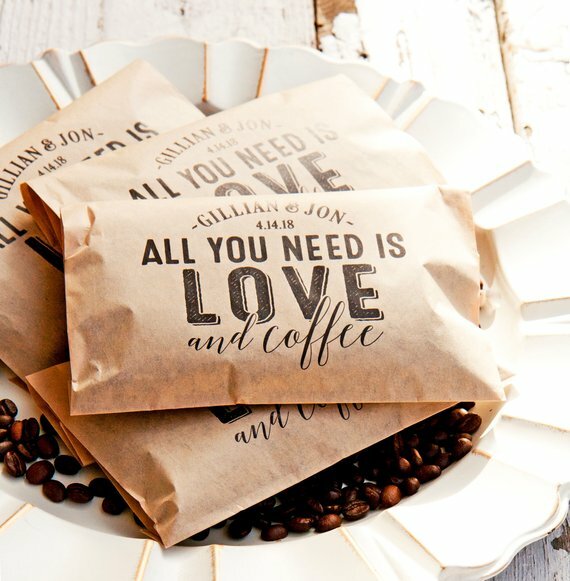 And “all you need is love and coffee” bags are another popular choice. I like the typography used on this one. There are coffee lovers, and then there’s hot cocoa lovers, and both are seriously passionate about it! 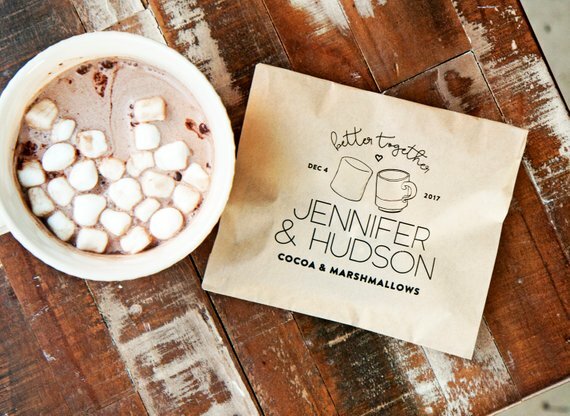 That’s why we needed to put these hot cocoa favor bags in their very own heading. 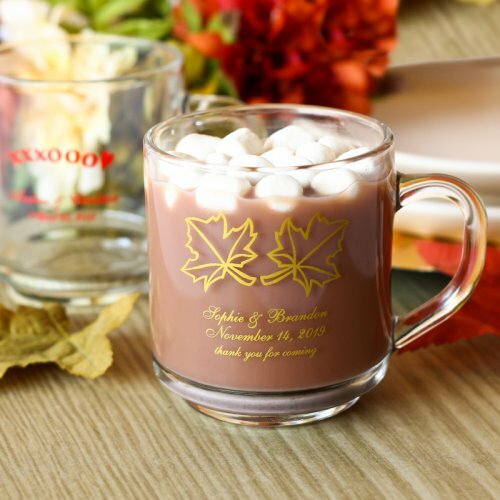 Coming in at #13, these hot cocoa favors are one of our favorite ideas for winter weddings. Don’t forget the mini marshmallows; those are always a huge hit! By Mavora. P.S. ICYMI: these cocoa ideas are also a huge hit. 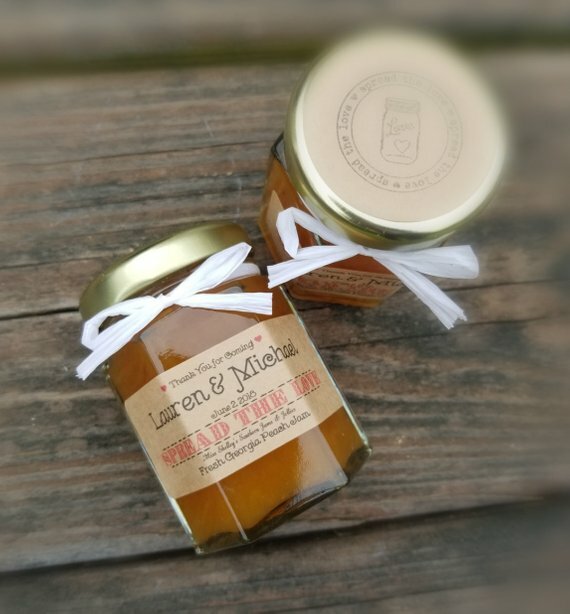 I don’t know if you’ll ever find a wedding favor that stays in the trending zone as long as these sweet jam jars, jelly jars, and honey jars. The secret is in the delicious jam (or jelly or honey) used inside, as well as the beautiful design of the jar itself. Add a spreader if you can — it really makes these cute favors pop! By Miss Shelley’s Southern Jams and Jelly. 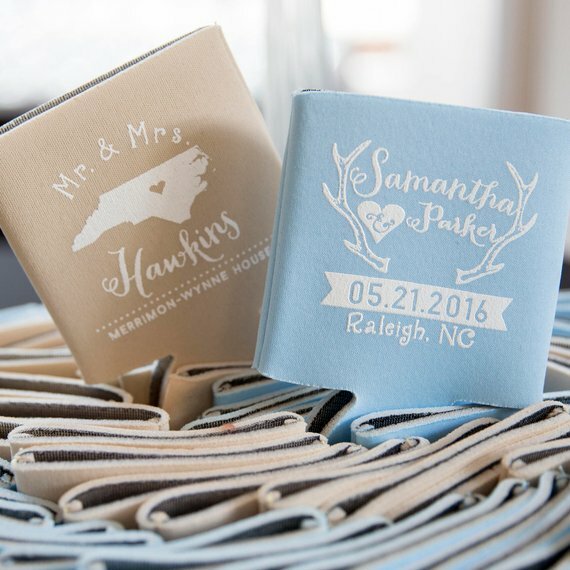 As you can imagine, there are plenty of customized favor options to choose from, along with toppers (burlap or fabric lid covers). 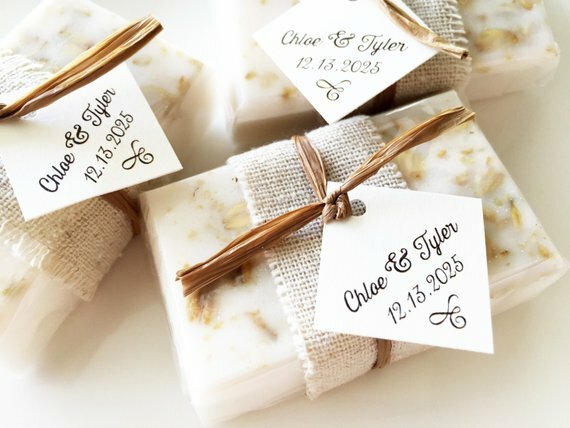 These are definitely one of my favorite wedding favors ideas to date. You can buy in bulk here. Shelley is amazing to work with! 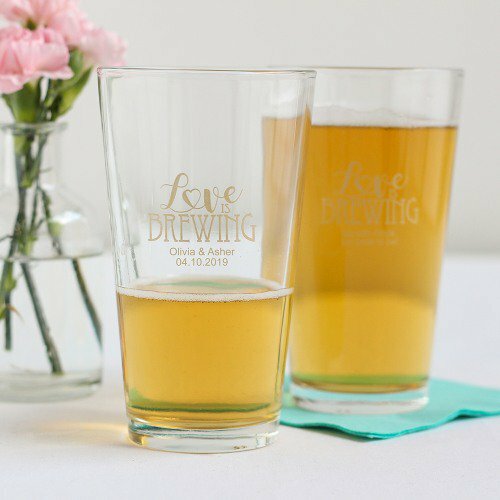 For craft brew (or traditional beer) lovers, these pilsner glasses make exceptional wedding favors ideas! 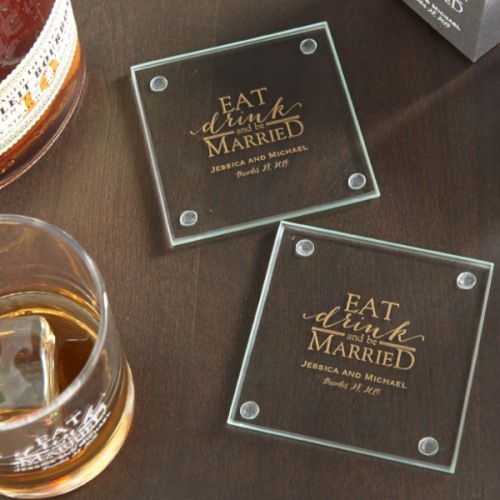 These also make awesome craft beer gifts for groomsmen, too. Buy here. 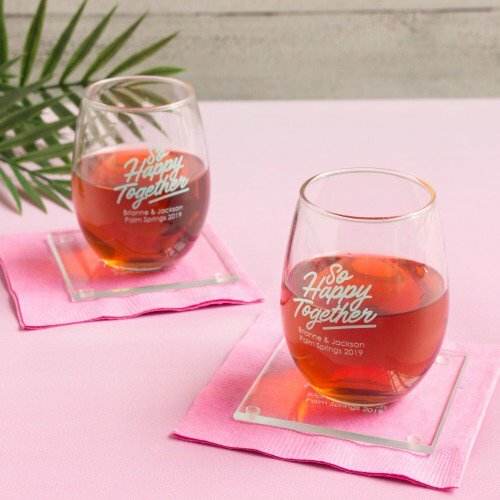 We could also see these as engagement party favors (for a stock the bar theme) or wedding shower favors — you know, like a cool beer-tasting couples shower. Prefer something on the rocks? 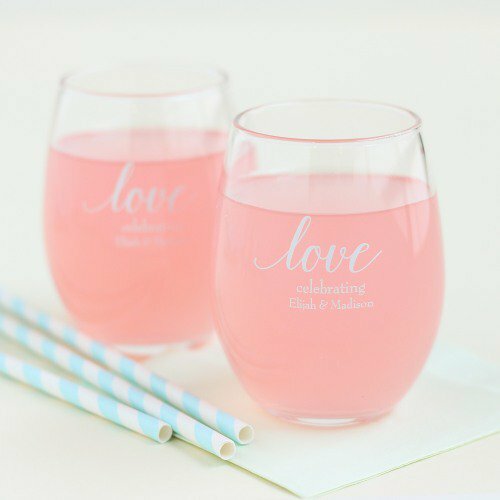 These glasses are another fun favor for guests! By Beau-coup. Buy them here. 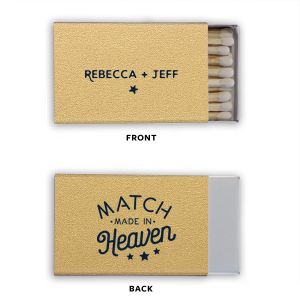 Ah, one of the most classic wedding favors ideas ever: matches! 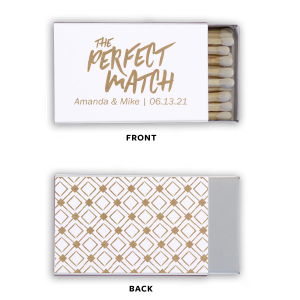 Today’s matchbox favors are taking on a whole new look, with you as the designer behind the helm at For Your Party, where you can add your style, pattern, font, colors, etc. to make these truly unique. Buy here. 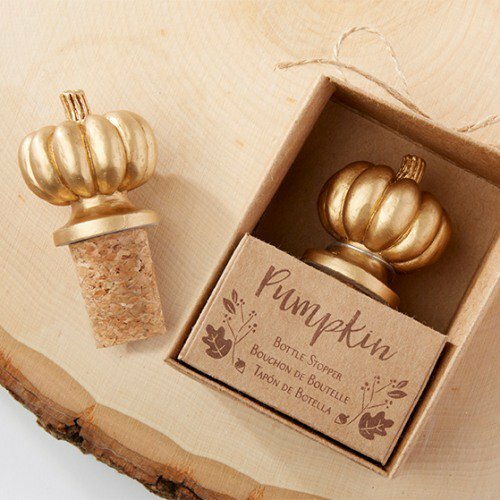 Another traditional favor in our list is a bottle stopper; a charming bottle stopper is a functional gift for your guests. 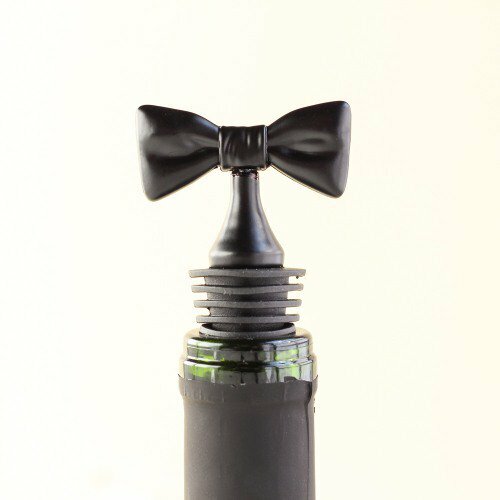 With so many styles to choose from, it’s easy to find a bottle stopper to coordinate with your wedding (and personal style). 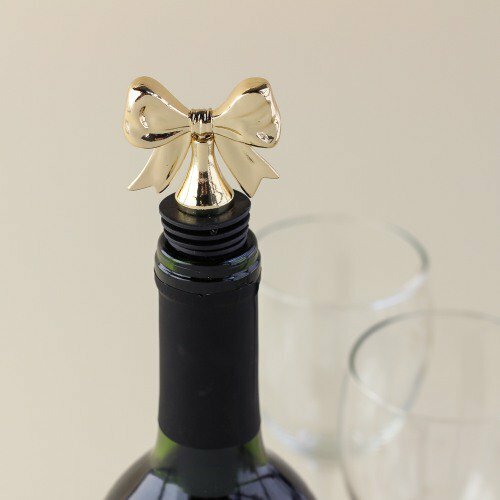 I love this gold bow stopper: it is very Kate Spade-esque. Buy here. Prefer the bow in black? We found it here. 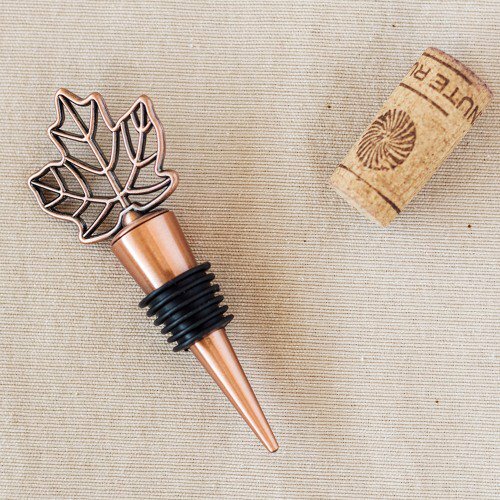 There’s a bottle stopper for every season, every theme — just name it. For instance, this fall leaf stopper is great for an autumnal wedding. Buy here. And for a little twist, this pumpkin spotted here is also a fun favor for fall weddings. 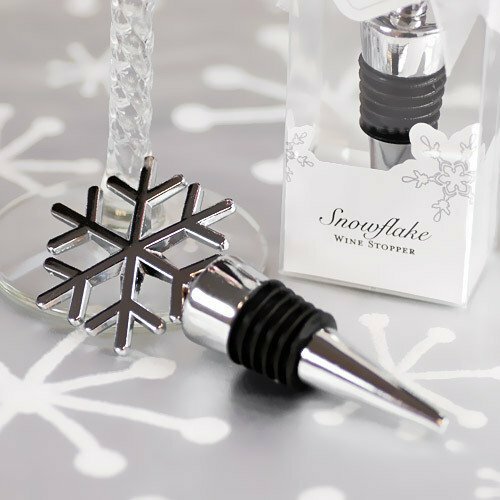 Here’s a snowflake bottle stopper for winter weddings, from here. For a winter wedding with a glamorous look (think: Art Deco / Gatsby or New Years weddings), this stopper is a perfect fit. Available here. Looking for a stopper that goes with everything? 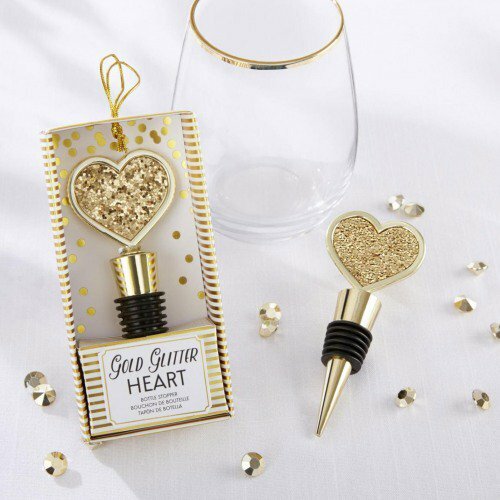 This is a bestseller and one of the top picks for wedding favor ideas: a gold heart wine bottle stopper. Affordable and functional — what more could you need? By Beaucoup. 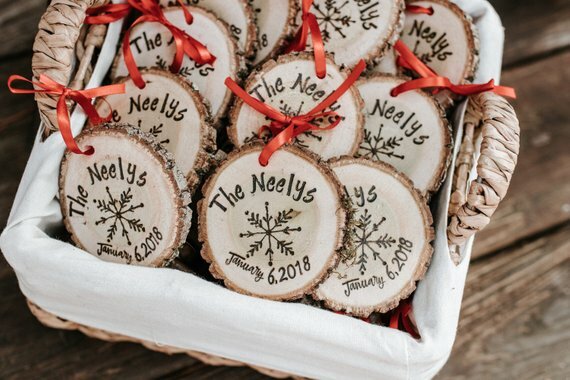 New to our list of wedding favors ideas are these rustic tree slices, which make exceptional ornaments. Spotted at Rustic Wood Slices and completely handmade. 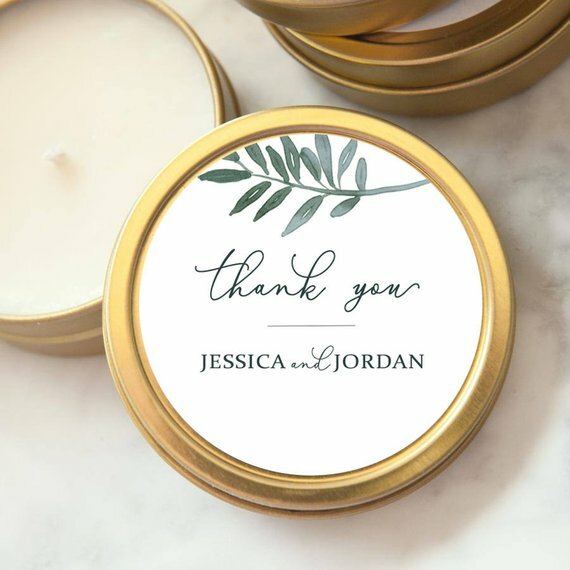 At the top of my list for functional wedding favors ideas are candles. Who doesn’t love a beautiful new candle? 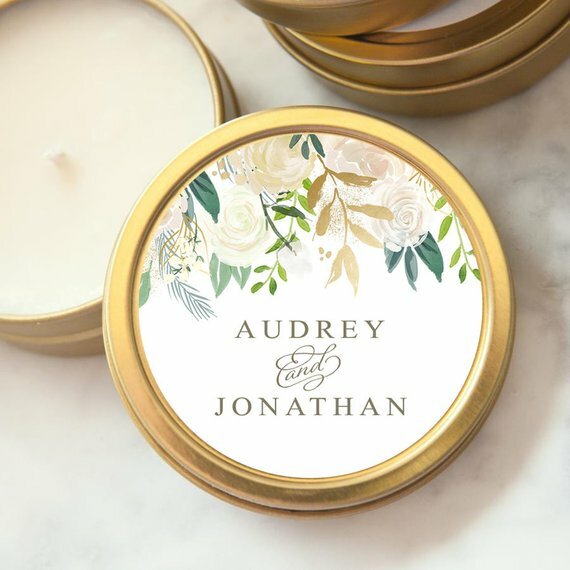 With exceptional scents and beautiful packaging, these candle favors are a win for any theme. By FoxblossomCo. 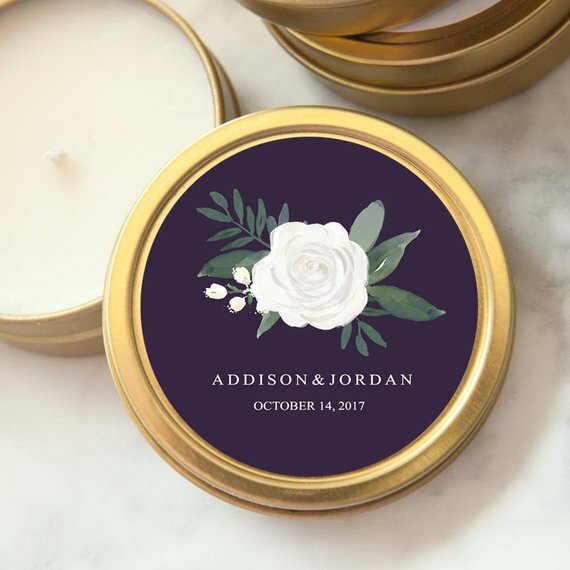 There are many styles available for these candle tin favors. Here are three of our favorites. And last but not least… soap! What’s more functional than soap? We love the handcrafted quality of these soaps from RusticJoySoap as one example. As another option, these soaps from Mod Party are another choice. 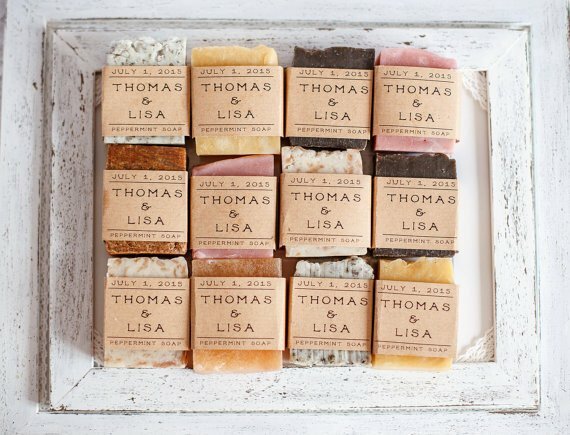 And these rustic soap favors from Sweet Clementine Soaps are another fan-favorite. 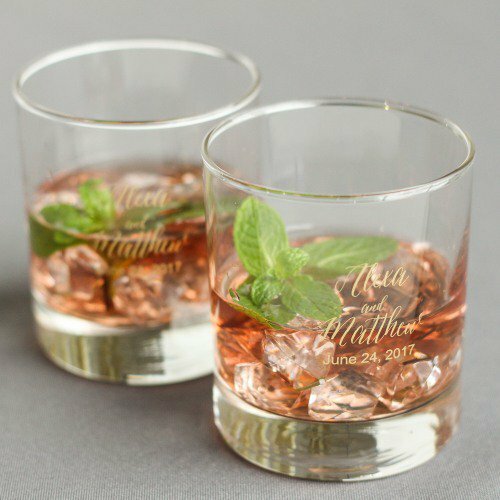 Save money on these wedding favors ideas!